Tattoo Blog » People need you to get tattooed. Seriously. Tattoo Blog » News » People need you to get tattooed. Seriously. People need you to get tattooed. Seriously. If you’re in or around Fredericksburg, Virginia this weekend, make your way over to Jack Brown’s Tattoo Revival between noon and nine p.m. for some fresh new ink. 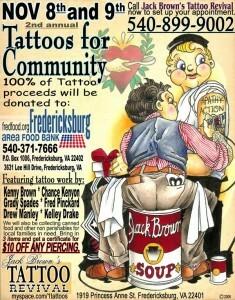 As part of the annual Tattooing for Community fundraiser, the Tattoo Revival team, alongside Salvation Tattoos’ Fred Pickhardt and Tattoo 702’s Drew Manley, will be giving tattoos in support of the Fredericksburg Area Food Bank, with 100% of the proceeds going to the charity. Last year the event raised close to $6 000 for the Rappahannock Council Against Sexual Assault. For those not interested in tattoos but still interested in contributing, the parlor will also be holding a canned-food drive for the Food Bank. Peeps who bring in three cans of food or more will be given ten dollars off any piercing. Jack Brown’s Tattoo Revival can be found at 1919 Princess Anne St. in Fredericksburg, VA. Give them a call at 540-899-9002 to find out more info about the event. Click here to learn more about the different ways you can help feed Fredericksburg’s families in need.